Worldwide shipments of flat-screen TVs have declined, marking a first for LCDs, a research firm reports. NEW YORK (CNNMoney) -- Got an LCD TV? Apparently, so does the rest of the world. The LCD flavor of flat-screen TVs are by far the most popular, making up 84% of the market, yet demand for them is waning. Shipments of LCD units declined for the first time ever, dropping 3% to 43 million units in the first quarter, according to an NPD DisplaySearch report released Wednesday. 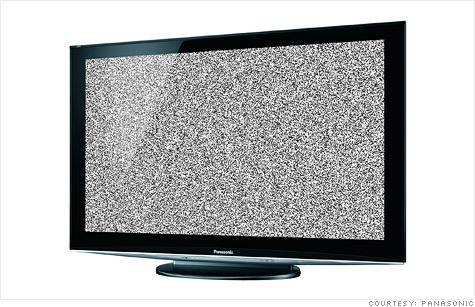 But things are even worse for other types of TVs like plasma screens. Overall TV shipments around the world, including non-LCD TVs, fell 8% to 51 million units in the first quarter from a year earlier. That drop marked the biggest decline since the second quarter of 2009. What's behind the slump? The market has become saturated with flat-screens -- most people already have one or more, said Paul Gagnon, TV analyst at NPD DisplaySearch. Consumers tend to swap out their TVs less frequently than they would their smartphones or computers. "When the penetration reaches pretty high levels and there isn't a super compelling reason to go out and upgrade a recently purchased TV, it leads to these soft spots, especially with the global economy being as weak as it is right now," he said. "People are just more conservative in their shopping behavior and they don't really see reason to go out and upgrade their TVs." While those in developed markets are well-equipped with TVs of their choice, Gagnon said prices are still too high to compel consumers in emerging markets. In past years, the price tags of these units dropped by 20% to 30% annually, but more recently, they have only been dropping by 5% to 10%. As retailers order fewer shipments, huge sales are not expected any time soon. So Black Friday deals this year probably won't "see quite the spectacular level of pricing that we saw last year," Gagnon said. Another research group, IHS iSuppli Research, also sees prices dropping slowly for consumers. IHS noted that the average price flat-panel TVs climbed 11.4% in the United States between December 2011 and April of this year, mainly driven by special features like Internet connectivity and LED backlight technology. "What we are expecting to see in the coming year or so is another attempt to differentiate TVs with technology features," said Tom Morrod, IHS head of technology. "This would help to prop up prices and will likely usher in the kind of competitive pressure we saw when Apple and Google capitalized on the nascent smartphone market." According to NPD, the top worldwide flat panel TV brands experienced a drop in revenue growth from the previous quarter. Samsung was the only company to have revenue growth year over year for its TVs, while sales for Panasonic (PC) and Sony (SNE) plunged more than 20%. Regionally, China continues to dominate TV shipments, accounting for 20% of all shipments, according to the NPD report. However, that's a 4 percentage point drop from a year ago. An earlier NPD report predicted that growth will decline in China because penetration is very high in urban areas, while prices are too high for the rural markets. This shipment decline may cause the TV manufacturing business to make some changes. "It's akin to the smartphone market before the iPhone," Morrod said. "[Consumers are] waiting for a reason to spend more money, but if one doesn't come along, then TVs will be in trouble longer term." If the Apple TV rumors are true, Apple (AAPL, Fortune 500) might be coming to save the day, yet again.